Tony Wheeler, co-founder of Lonely Planet, is a self-confessed “miserable linguist” yet he’s been to virtually every country in the world. His lack of aptitude with languages didn’t stop him from travelling all round the globe. What’s the secret? I think it’s a mix of self-confidence and being able to listen too. All communication, whether travelling or not, just requires a bit of empathy and effort for both people to understand and enjoy talking to each other, whatever their background. When I first went travelling, the one thing I was most worried about was the language barrier. I started off travelling in Australia because I knew it would be easy, but I also really wanted to go and see Angkor Wat in Cambodia. It seemed like it would be a really daunting journey. How on earth would I be able to travel in South East Asia and make myself understood? I was and still am hopeless at picking up foreign languages. It took me three weeks – three weeks! – to be able to say “thank you” in Thai. But my ignorance of Asia was so total before I arrived that I hadn’t even considered the fact that English was widely spoken across the continent, albeit in varying levels of fluency. It was enough to get by, and with some practice I managed to not only make myself understood, but to be able to have quite far reaching conversations on occasion too. The biggest hurdle about starting a conversation when you don’t share a common language is feeling self-conscious about making a fool of yourself. But by confidently asking a question in clear, simple English as soon as you walk into a situation, you immediately make the situation clear – you want help. Most traveller conversations involve buying stuff – whether it’s goods, a service, or a ticket – or finding out information. If you wander in and shuffle around avoiding eye contact with whoever’s around, you make both yourself and whoever’s there feel uncertain. So, even if you don’t feel confident, pretend to be – it really is true that by forcing yourself to appear confident, you actually become more so. Take the initiative and be clear about what you want and you make the converation much easier and more pleasant for both of you. It really helps to think about what you are going to say before you say it and keep it as simple as possible. Don’t use five words where one will do. “Please may I have a Coke” is very polite in English but can be confusing for a second language speaker. “A Coke, please” is a lot better. Avoid speaking in pidgin English though. That just makes you sound veerrry stupid. Body language is supposedly 90 per cent of communication, and eye contact and smiling are the key to making a connection with someone else. When you give your full attention and focus to someone else, even if it’s to do the simplest thing, it makes making yourself much more understood. One of my Thai friends tells me it’s much easier to understand foriegners speaking English when he can read their lips – whereas talking on the phone can be quite tricky. But it’s amazing how is conveyed non -verbally even if you are not speaking a coherent sentence. Don’t automatically assume if you are talking to a shopkeeper or a tour operator that they are going to try and rip you off and so be wary and guarded. Go into a conversation fully open to it – if someone starts giving you the hard sell, you can politely decline and exit. Being polite is actually less effort and more rewarding than being cagey, which does nothing but make it more difficult to communicate what you want. It certainly doesn’t make you less liable to being ripped off. Most of all, treat people as people. Don’t look down on them as a grubby little vendor who you are deigning to patronise with your custom. Irrespective of what you behave like at home, call every local you talk to “sir” or “ma’am”, whether or not you think they can understand you. That goes for everyone, including taxi drivers, cleaners and waiters. Your body language is what does most of the communicating, not your words. If you are speaking to someone with respect, they will see that, whether or not they can understand what you are saying. Bonus tip: Try not to be listening to 50 Cent on your iPod directly before initiating a conversation. Of course, if you’re going to be in a country for more than a couple of days, you really should make the effort to at least learn a few of the basics. I’ve found that being able to say Hello, Yes, No, Please and Thankyou in the local language really does get you a huge amount of credit, because it shows a little effort and respect on your part. The one extra vital phrase is “Excuse me” or “Sorry”, which makes you sound really polite and ultra respectful. This gets you a lot of kudos too. Possibly the most important thing of all – listen to what someone is telling you. Sometimes the accent people speak English with can make them difficult to understand. Don’t be afraid to ask someone to repeat what they are saying, but make sure you are actually trying to hear what they say. Often the context of the conversation will help you figure out the answer. The real key to getting by on just English is having a little humility. Try not to get frustrated if someone cannot understand you – they are the ones who have made the effort to learn English as a second language. If you cannot be understood, stop, smile, and try again, with a more simple sentence. Even if you’re staying in an upmarket hotel, don’t get too upset if the staff can’t fully understand you. Accept that they’re doing their best and try to demonstrate patience to not make them feel embarrassed. It doesn’t really help you if you lose your temper, especially in Asia. Remember as well that the pronunciation of famous Western brands often gets bastardised by local languages, so that how you say Coca Cola isn’t necessarily how the locals will say it. I once tried to order a Coke in a little roadside shack in Thailand with my rudimentary Thai. “Aow Coke, kap”, I said, feeling very pleased with myself that I’d said “I want a Coke, please”. The owner looked very puzzled. “Coke” I said again, smiling. A shake of the head. “Um… Coke?” I said again, pointing to the enormous Coca Cola sign right behind her head. “Oh, Coooke!” she said, perfectly demonstrating the Thai tonal elongation of vowels which renders the word completely different to Thai ears. 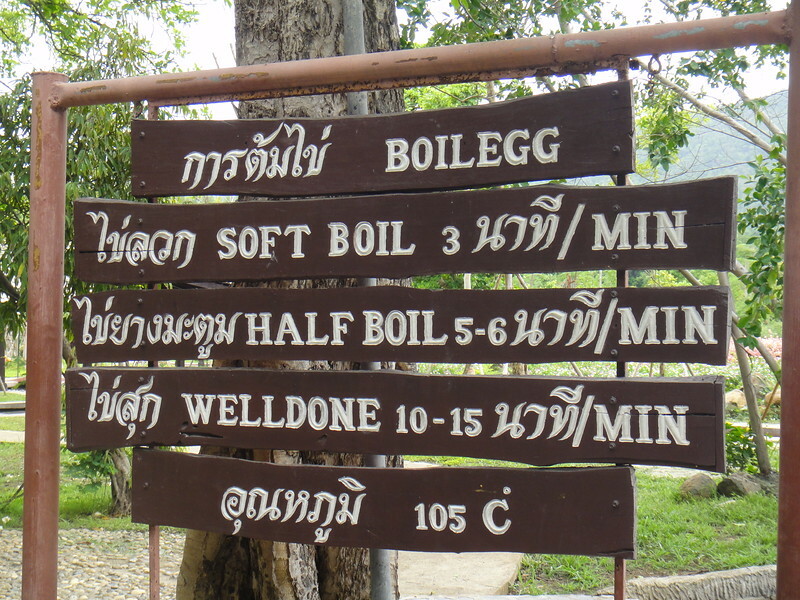 Now when I speak English in Thailand it tends to be Thai-ified a bit, to fit with the way the Thais pronounce words. You simply get an ear for this thing after a while – for me it took a long time to recognise, but you might be one of the people who can lock in to this sort of thing quickly. Sometimes you have to give up on words and start using gestures – and this is where the fun really starts. Again, it’s all about confidence – if you can try and outline by mime what you need with good humour, then you will have a lot better chance of being understood. This is pretty exhausting for both sides, so don’t overdo it. Thankfully waggling your arms bent at the elbow seems to be universal for chicken, so dinner is never far away. For sure there are some countries where it’s much easier to get by speaking English and also regions within specific countries where English is more understood than others. In India, the Philippines and Myanmar, for example, fluent English is very common whatever people’s social status thanks to the colonial heritage of those countries, while through Thailand, Malaysia, Laos, Vietnam and Cambodia you’ll find varying degrees of English spoken – it’s always enough to get by. If you’re planning a big trip, you might want to start out somewhere fairly easy to get used to the rhythm of travelling and then be intrepid and head for the more difficult but ultimately rewarding places, like China. What do you think? Do you have any more tips to help with travelling when you only speak English?